Q1. The average age of a family of 6 members is 21.5 years. The family includes two couples, one boy and one girl. The average age of first couple is 50% more than the average age of second couple. If average age of children (girl and boy) be 8.5 years then what is the total age of younger couple? Q2. Two trains R and S having their lengths in the ratio of 9 : 11 are running towards each-other from two opposite stations. They cross a platform which length is 50% more than the average length of trains in 16 and 24 seconds respectively. Find the ratio of speed of train R to that of train S.
Q3. Two persons Mr. X and Mr. Y bought an article for the same amount. Mr. X marked the price of article 25% above its cost price to him and sold it at 10% discount while Mr. Y did not mark any price and sold the article at a profit of 25%. If Mr. X sold it in Rs. 360 then find the profit earned by Mr. Y.
Q4. How many numbers of five digits can be formed by using the digits 1, 0, 2, 3, 5, 6 which are between 50000 and 60000 without repeating the digits? Q5. The ratio of efficiencies of two filling pipes is 4 : 5. There is a third emptying pipe which efficiency is two third of the average efficiency of first two filling pipes can empty a filled tank in 36 minutes. In how much time both the filling pipes can fill the tank when it is empty? Directions (6-10): What will come in place of (?) in the following no. series? Q7. 8, 64, 216, 512, 1000, 1728, ? Q8. 3, 4, 10, 33, 136, 685, ? Q9. 16, 12, 18, 40.5, 121.5, 455.625, ? Q10. 4, 18, 48, 100, 180, 294, ? 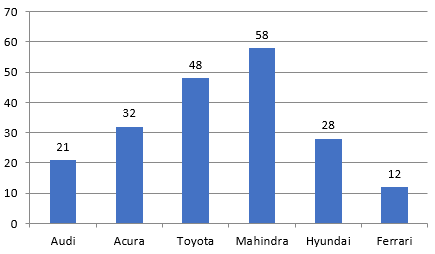 Directions (11-15): The bar graph shows the sales of six different car-manufacturers in 2016 (in thousand units) in India. 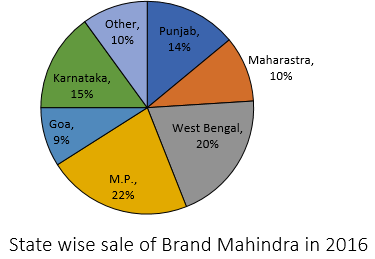 The pie-chart shows the break-up of sales of Brand Mahindra in 2016 in different states of India. Note→ All manufactured cars are sold in these given 7 states. Q11. What is the difference between the sales of Mahindra in West Bengal and that in Goa? Q13. If in 2017, the total sale of Brand Mahindra increases by 12%, while its sale in Maharashtra is increased by 34% and in M.P. by 22%, what is the approximate sales increase in the rest of the states together? Q15. If total sale of all brands together increases by 20% in 2017 and sale of Mahindra in West Bengal increase by 10% keeping percentage distribution of Mahindra in these seven states same as previous then, what is the total sale of all cars in 2017 of all brands except brand Mahindra. Directions (21-25): The following table shows the number of persons who got injured in earthquake from five different states of India during five different years. Study the table carefully to answer the following questions. Note: Some data in the table are missing. Find them if they are required in any question and then proceed. Q21. If total no. of person in Maharashtra who injured due to earthquake in 2004 was 150% more than the total no. of person from same state who injured in earthquake in 2008, then the total no. of person who injured in earthquake in 2005 in Maharashtra is what percent of total no. of persons who injured in 2008 in same state (It is given that total persons who injured in earthquake in Maharashtra throughout all the years is 88,000)? Q22. Total no. of person who injured in earthquake in Bihar and Maharashtra together in the year 2005 is what percent more or less than that from Gujarat and Bihar together in 2006? Q23. If difference between the no. of person who injured in earthquake in Gujarat and Assam together in 2005 is 32,000 and total no. of persons who injured in earthquake in Assam was 25% more than that in Kerala in 2005 then find the total no. of persons who were injured in 2005 due to earthquake in all the states together? Q24. If 32%, 24% and 18% persons out of total injured persons in state Gujarat, Bihar and Maharashtra respectively died in the year 2006, then find the total no. of person from these three states together who are still alive. Q25. If ratio between total no. of persons who were injured in earthquake in states Bihar and Maharashtra in the year 2008 is 5 : 4 and total person who injured in 2008 from all states is 63,000 then total person who injured in 2008 in Bihar and Maharashtra together is what percent of total person who injured in 2008 from all states together? Directions (26-30): What should come in place of question mark (?) in the following questions? Q26. 115% of 4880 – 85% of 1640 =? Q30. 5.35 + 4.43 + 0.45 + 45.34 + 534 =? Q31. Mr. Arun can make 40 questions in 5 hours and Mr. Veer can make 45 questions in 9 hours. If Mr. Arun takes help of Mr. Satish then both can complete 40 questions in 2 hours and if Mr. Veer takes help of Mr. Ayush then both can complete 45 questions in 5 hours. Find in how much time Mr. Satish and Mr. Ayush can complete a set of 24 questions together? Q32. Three years ago, the population of a village was 18,000 and ratio of male to female was 3 : 2. If the increasing rate of male was 16⅔% per annum and that of women was 5% per annum then what will be the total population of village before one year from the present population. Q33. In how many different ways the letters of the word ‘Cocabanana’ can be arranged such that ‘c’ does not come together and each word contains ‘b’ and ‘o’ at the end places? Q34. Two persons Hariya and Ramu together can do a job in 32 days. They started working together and after working 8 days a third person joined whose efficiency is three fourth of that of Ramu and they worked together for another 2 days. After this, Ramu left the job and remaining job is done by Hariya and third person together. If Ramu alone can do the job in 48 days then find the total no. of days from start in which, the whole job will be completed? Q35. The length and breadth of the floor of a room are 20 feet and 10 feet respectively. Square tiles of 2 feet length of three different colours are to be laid to the floor. Black tiles are laid in the first row on all sides. If white titles are laid in the one-third of the remaining and blue tiles in the rest, how many blue tiles will be there?